Parks Canada turned 100 on May 19, 2011. In recognition of its conservation efforts it received the WWF Gift to the Earth Award. Watch the video below to learn more about Parks Canada’s recent conservation successes. The addition of Lancaster Sound as a National Marine Conservation Area is fantastic news – it is home to millions of seabirds, like these thick-billed murres on Prince Leopold Island. Paul Nicklen is probably the world’s top Arctic and Antarctic photographer. His photos are unequaled, as is his zeal to get THE shot. This excellent TED talk gives a taste of the lengths he goes to to get his award-winning photos. Enjoy. Brüdder Productions produced a new short movie, entitled Anirniq (Breath in Inuktitut) as a submission to a global competition called Parallel Lines. The rules of the competition are that that films can only 6 specific lines of dialogue, in sequence. Shot in northern Baffin Island, the movie features gorgeous cinematography and a great interpretation of the dialogue. I just came across this Toronto-based company – Arctic Kingdom – that has been leading one-of-a-kind adventures into the arctic. Looks like an interesting operator. We just published a set of great stories about Nunavut – in celebration of the territory’s 10th anniversary on April 1. My favourite one is the story on Quttinirpaaq National Park on northern Ellesmere Island. Would love to go there some day! Taking a cruise into the Arctic is becoming more popular, but it does not come without negative effects, writes Jane George in Nunatsiaq news. Elu lodge is a high-end Inuit-owned lodge, across from Victoria Island on Nunavut’s mainland. If you are looking for an escape to the heart of Canada’s Arctic, and want to see its abundant wildlife, look no further than this lodge. See a recent article on the lodge in the San Fransisco Chronicle for more information. A total solar eclipse will hit northern Nunavut early in the morning on August 1. Map of the eclipse’s path. It should be pretty as the eclipse will start just after sunrise. Total eclipses are rare enough (they occur about once per 12-18 months) and they have a tendency of appearing in remote parts of the globe. 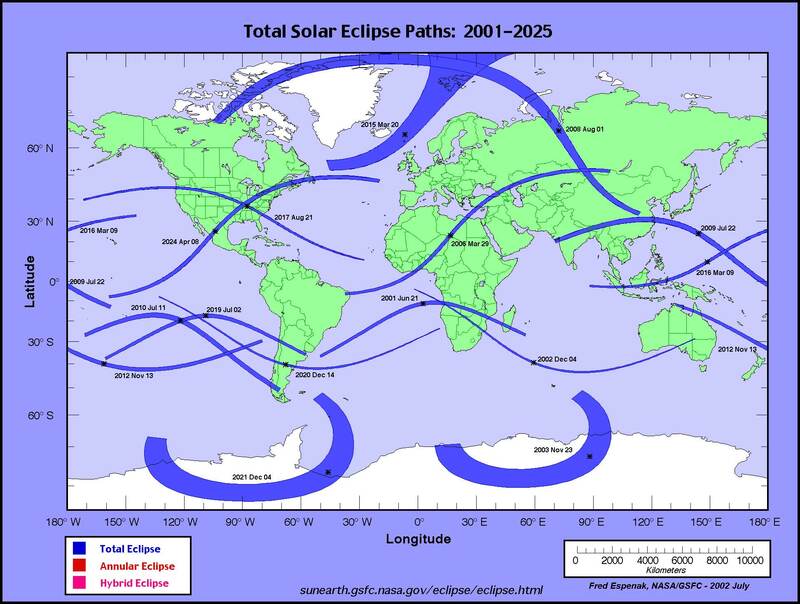 See this map of solar eclipses until 2025. The next time a total eclipse returns to Canada is on April 8, 2024. Everythying you wanted to know about the eclipse is here. So it is worth travelling to Nunavut to see this one. Only one slight problem: it is so expensive to get there, that from Vancouver it would be cheaper to travel to China or even Bayan Olgii in western Mongolia to watch the eclipse there. And the chances of getting clear skies are much better in Mongolia and China (map). Grise fiord is the only Canadian town in the path of the eclipse. To get there, you first fly to Iqaluit via Ottawa or Montreal, then onwards to Resolute, and from there to Grise Fiord. Total cost: probably well over $4000 (!). From Resolute to Grise Fiord alone is about $1000 return. The list price from Iqaluit to Resolute alone is $2200. It’s difficult to promote tourism in this area when it is so hard to get there. To get to Bayan Olgii, you take a non-stop flight to Beijing, another one hour flight to Ulaanbaatar, and then an interior flight to Olgii. Probably less than $1500 or so return. You could also watch the eclipse in northern China, just one flight and a bit of overland travel away. You’d just have to get well away from Beijing and its pollution. The southern Gobi would be a good place to watch. I love the north, so am always on the lookout for places to travel. I just came across the Nunavut Parks website. Very pretty site, describing some very special places (if you don’t mind parks without trees!). I’ve spent a summer on Devon Island and Prince Leopold Island, but never in any of the parks. I’d head for the Thelon River tomorrow!